Wisdom teeth (third molars) are the last teeth to develop and appear in your mouth. They come in between the ages of 17 and 25, a time of life that has been called the “Age of Wisdom.” Wisdom teeth are typically removed early in adulthood to avoid impacted teeth. When a tooth is not able to grow completely into the mouth, it is called an “impacted” tooth. Generally, impacted teeth are not able to break through the gums as there isn’t sufficient space. 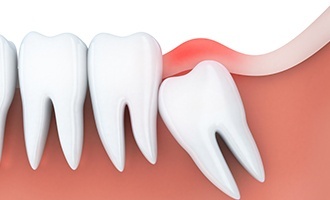 Typically, 9 out of 10 people will have at least one impacted wisdom tooth if they are allowed to fully grow in. If left in the mouth, these impacted wisdom teeth can end up damaging neighboring teeth or could become infected. Since it is difficult to brush the 3rd molar space in the mouth, this area tends to invite bacteria, leading to gum disease. Oral bacteria can also travel through to the bloodstream and lead to potential systemic infections and illnesses which affect the kidneys, heart, and other organs. Tooth pain can often be unbearable. Damaged teeth or impacted wisdom teeth in your mouth may often cause future complications with your healthy teeth and may need to be extracted. Whether you are experiencing pain from a problem tooth or need your wisdom teeth extracted, Dr. Bancroft will guide you through the process to keep you as comfortable as possible. We will also work with your insurance to help estimate any costs you may incur. 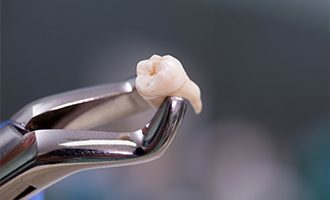 What Happens When My Wisdom Teeth Are Removed? Before removing your tooth, Dr. Bancroft will give you a local anesthetic to numb the gums and surrounding area where the tooth will be taken out. After the tooth is removed, you may need stitches. You can gently bite down on a cotton gauze pad placed over the wound to help stop the bleeding. A post-operative appointment may be necessary to check healing and remove stitches. A period of inactivity may be recommended after an extraction to help aid healing as well.